BUVUMA – A car accident in Buvuma district on Friday evening has claimed seven (7) people and left 17 injured after a truck failed to negotiate a corner at Walwanda mosque junction. The incident involved a white canter, Reg No UAR 241M, which failed to break. The injured and the dead were all taken to Buvuma Health Centre IV and Kawolo hospital. The deceased are yet to be identified as most of their relatives have not yet arrived. This is the first accident in the district of Buvuma of such magnitude. 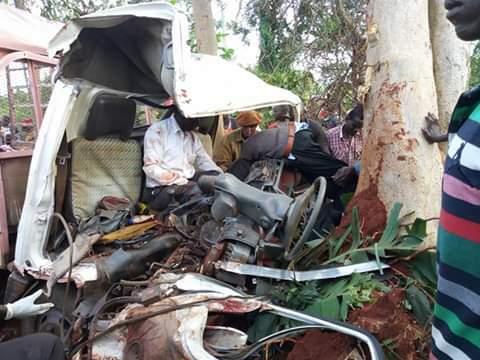 The incident comes after a Rwandan businesswoman died on spot when the vehicle Mitsubishi Fuso she was travelling in lost control and overturned in the sharp corners of Kabalaga hills in Kabale district on Wednesday. Kigezi Region Police Spokesman Mr Elly Maate said that the vehicle was carrying merchandise from Kampala and was heading for Kigali in Rwanda. He only identified the deceased as Lucy. The accident happened around 4.30 pm, four kilometers to Kabale town on Mbarara-Kabale Highway. Mr Maate said that the driver of the vehicle Mr Paul Kintu, a resident of Mulukwanga village in Wakiso district was rushed to Kabale regional referral hospital for medication. Meanwhile, another woman was on Thursday morning knocked dead as she crossed Lugazi Post Office roundabout in Lugazi municipality. The Ssezibwa Regional Police Spokesperson, Ms Hellen Butoto, identified the deceased as Ms Zaina Namayenga. Mr Thomson Tumusiime, 44, a resident of Bwaise-Kazo Village in Kawempe Division who was driving truck registration number UAU 756L – believed to have knocked Ms Namayenga dead – is being detained at Lugazi Police Station. The cause of the accident is under investigation, Ms Butoto said, while the body was taken to Kawolo Hospital mortuary from where it will be claimed by her relatives who are yet to be notified. Ms Butoto appealed to drivers to observe road signs and avoid causing such incidents.